In my first week at camp I was warmly welcomed by my friend and fellow Speed River teammate, John, and other fellow Canadians, Neasa and Kristina (Vancouver), and my roommate, Julia (Ottawa). They made me feel right at home, showing me around the camp and endless dirt roads. Prior to three of them leaving, I knew Julia would be a constant because her departure date was just 1 week before mine. It was comforting to know that we spoke the same language, and within a few days we knew we would make good roommates. We easily got to know each other and quickly fell into a nice routine of going to bed and waking around the same time, eating and running together but not all of the time, and spending our leisure/rest time enjoying different surroundings. Because of a bad experience in high school where I got sunburned before an important track meet (remember, Coach Murray Jackson?! ), I have been very cautious about the amount of time spent directly in the sun. It easily drains me. Consequently I enjoy my mid mornings and afternoons in the room with the door open, the Kenyan music playing nearby, the fresh smell as the rooms are cleaned, and the gentle breeze while the staff go about their business. I can easily FaceTime my family and use my computer because I purchased a SIM card. Staying near the wifi pool/lounge area was not necessary. Julia had already been here a month prior to my arrival so she had a nice routine previously established. It can be a bit daunting, going to another country to train for a month, not knowing how your rooming situation will work out. I am pleased to say everything is great. Thanks, Julia! I knew I needed to reach out and get to know the others at camp. Prior to coming, I was prepared to eat meals and do all my training on my own but was hoping that I would hook up with some english-speaking Europeans. Sure enough, my “New Balance Belgium couple” became my BFF’s at the HATC. Frank used to pace many of the diamond league and world major events, and is now recovering from foot surgery while managing and supporting Manuela’s marathon career. She too completed in Rio when I did. Within a few meals, we nicely discovered that our training plans were similarly matched, we were both racing on April 23, and at the camp for the same time period. It couldn’t have been better. Add in Julia for my first few “easy” runs while getting used to altitude, and some English and French guys, and I had myself a perfect group. I think one of the first things I noticed at camp is how much the people are alike. Meals are important and can never be missed, recovery is just as important as training, many have a love/hate relationship with core exercises (particularly when we do the class and the instructor counts 1 second for every 2), bedtime is between 9-10 pm, and we all realize that we are living in somewhat of a running fantasy world. Our beds are made, towels are fresh, rooms are clean, meals are made, and our entire day built around our running schedule. There’s no stress, massages are absolutely wonderful, everyone is pleasant and working toward their race goals. Each day I try to reflect upon this incredible opportunity; training for one month at altitude with absolutely no distractions while aiming to run a personal best was a dream that I am now living. Today was a fairly typical day. I ran 23 km (with some strides) with Manuela and Julia in the morning, had breakfast, rested, did laundry, ate lunch, read, ran 12 km with Manuela, did my core/bike/sauna/sauna routine, showered, had dinner, and was in bed at 9:00 pm. Today Bekele met me at 6:30 for a tempo workout. 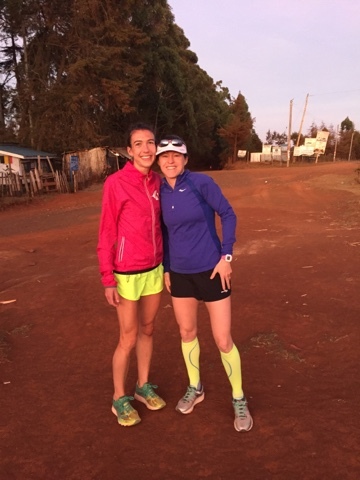 We warmed up on the dirt path toward Eldoret then moved to the tarmac road for 19′, 16′, and 13′ with 5′ (‘ is minutes) recovery jog between sets. We cooled down on the dirt path again then caught a matatu back with Julia, just in time to have breakfast at the camp. I did some preventative maintenance (stretching, rolling), rested, had lunch, read, then went on an easy 11 km run with Frank, Manuela and Laurent (France). Today was my most adventerous and tiring morning. I ran with Julia along the fartlek route but then slowed the pace down a bit, which consequently resulted in me getting lost for the first time. They say it happens to everyone, at least once. So after many confirmations that I was heading toward Iten, a scrape along the shin from a barbed wire fence, and short piki piki ride to the tarmac road, I was safely back to camp with a 25 instead of a 20-21 km run. Julia was so kind – she had set my breakfast aside in the dining room. At 10:00 a group of us, led by Manueal and Frank, headed into Iten to visit a school. I really enjoyed myself and the children just loved having a group of mzungus there. I hadn’t been in the sun during peak heat hours so got a slight sunburn. I was a bit worn out so after lunch, I settled into my bed with lots of water and my book, and called it a day, other than getting more water and having a mid-afternoon massage. By dinner I was feeling back to normal again. We took a nice group picture because people were starting to depart the next morning. Bekele, Frank, Manuela, Julia and I headed to Lornah’s new track, which was a nice 2.5 km jog from camp. We warmed up a bit longer, did some strides then each started our own workout. Manuela did 400’s, Julia did 200/300’s and Bekele paced me through a 2’/1′ fartlek. I quite enjoyed the flat surface, which helped create a steady workout with even splits. The track is fenced and free for use for people staying at the HATC but 1000-2000 shillings for others. After our workouts, we jogged around the track and back to camp for our cool down then had the usual oatmeal, bread, eggs, juice, and coffee/tea breakfast. The rest of the day was fairly routine with a 12 km easy afternoon run, time at the gym, and a beef, ugali, sukuma wiki, and mashed potato dinner. I spent a bit of time in the lounge before calling it a day. Tomorrow a group of us will meet at 6:30 am for an easy 15-16 km run. It will be the last run for the British guys. From Lyndsay in December, Katherine and Lanni in January, Neasa and Kristina in February to me in March, Bekele has had a steady flow of pacing duties from a stream of Canadian women. Thank you, Neasa for taking me under your wing and being such a great support: when I got teary on our first run the day I arrived, by showing me around Iten, and making the HATC feel like home. It was an absolute pleasure to get to know you. After saying goodbye to John, Neasa and Kristina, I found a new group of friends. Breakfast at the club after a long progressive run to Eldoret with a matatu back to camp. One of the best things about being here is that everyone is so much alike. Ralph (England), myself and many others packed cans of fish to supplement some of the meals. Sardines was the choice for both of us at this particular lunch. Axel (France) and Paul (England), two really good friends and good guys, who are rooming across from Julia and I.
Kerio View – a place to go have something to drink or eat, and enjoy the view with friends. Kristina and I went for coffee, right before she left. The lounge has a tv and wifi, equipped with couches for relaxing after a hard training day. Signing in at the school. No police check or identification required. Manuela and Krista with the children. Inside a classroom. Paper, pen/pencil and a simple desk is all that is needed. Here on the desk is a notepad and pen, generously donated to the students by Manuela and Frank. In this particular classroom, it appeared that the children were studying english grammar. I love it when it people give back. Here, my good friends, Manuela and Frank (aka my “New Balance Belgian couple” who are at the HATC for the 5th time) are seeing their sponsor child for the first time since last year. Manuela is telling him how much he has grown. There were about six of us who walked into Iten to visit the school. We introduced ourselves, stating our name and country. This particular boy became popular when I said that I was from Canada! Everyone pointed out his t-shirt. At first he was shy, but then I don’t think he minded the extra attention. The children were thrilled that they got to go for an early recess because of our arrival. Some played soccer, did gymnastic moves, chanted cheers, or showed pictures from home and chatted with the students. I showed them pictures of snow, ice hockey, a swim meet, and my family with me at the Olympics. While waiting for a massage with Dan, I met his daughter who made me think of and miss my own. Group shot of the gang before people starting departing. Countries: France, Canada, England, Belgium. Seems like everyone posts one of these pictures during their stay in Kenya. The scrape was from a barbed wire fence, the red dirt is from a morning run, and the pathetic and hopeless toes are from endless kilometers over the years. Chasing Bekele in a fartlek workout on the track. No hills this time! Meanwhile, the rest of #TeamDuChene is enjoying snow and a wonderful ski trip in Alberta!